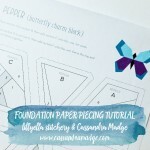 Hi and welcome to part 2 of my Foundation Paper Piecing tutorial. If you missed part 1, you can find it HERE. 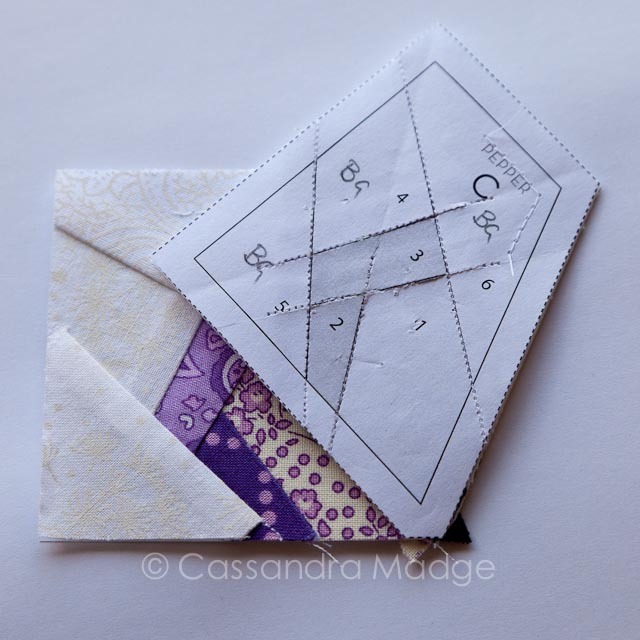 Again I would like to gratefully acknowledge Nicole Young, of lillyella stitchery, for graciously allowing me to use her Butterfly Charm Block for this tutorial. Best of all, the pattern is FREE, so you can go and grab your own from Craftsy right now, download it and sew along with me. We will be stitching her butterfly called Pepper today. If you need help on printing your pdf out to actual size, my Mac tutorial is HERE. 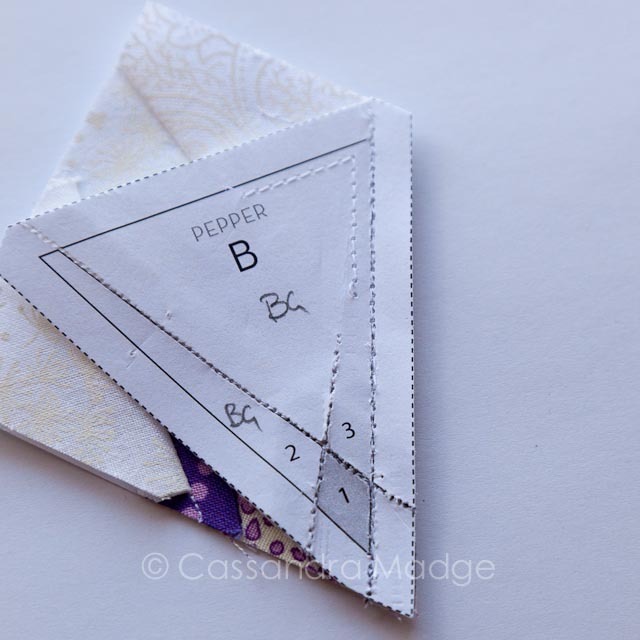 In part 1 I showed you the basics of paper piecing and we have completed sections A-F of Pepper, the Butterfly Charm Block. 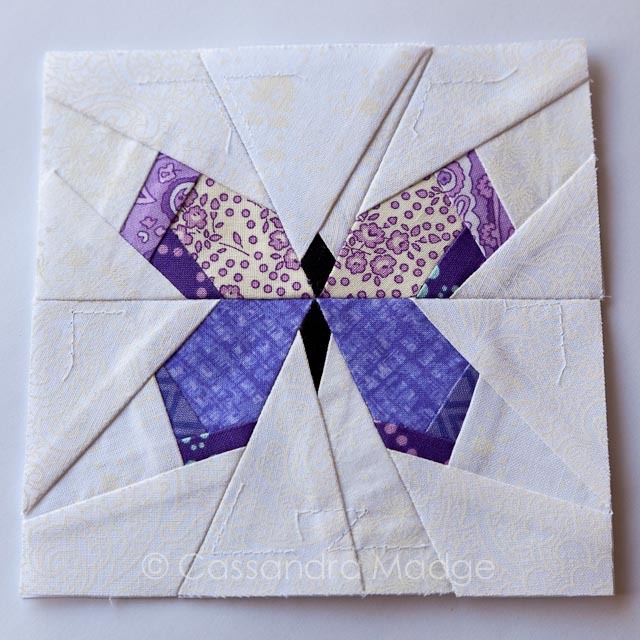 Today is all about joining those 6 pieces together to make a complete 5″ butterfly block. 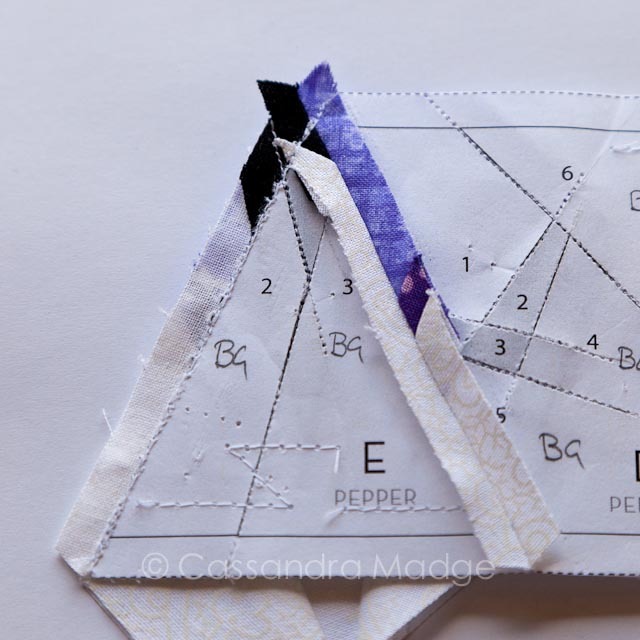 Nicole’s pattern is beautifully designed as you will see piecing these sections together. 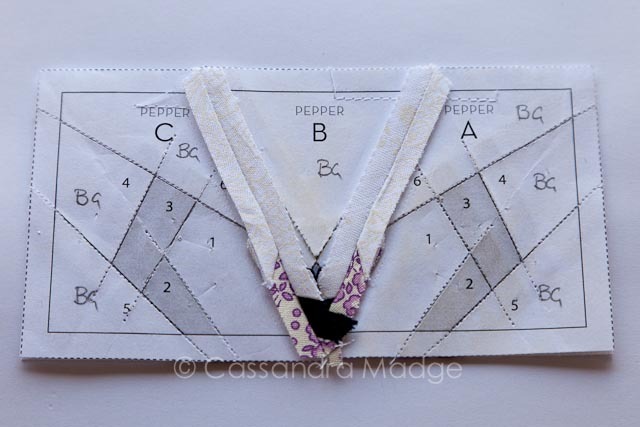 Her recommended order is simply alphabetical, so we will start by stitching A + B together. You can see by the arrows above that these two have been designed to fit perfectly together. 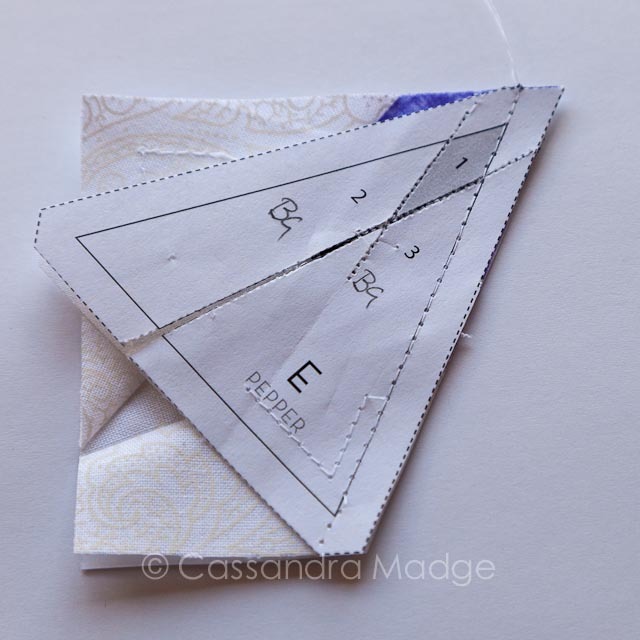 When you align the seam edges, these flat trimmed sections will help you to match the seam up beautifully. 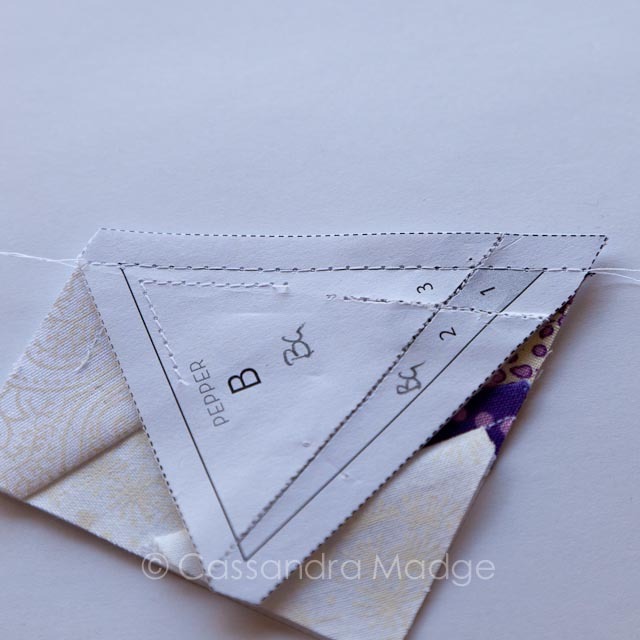 The idea is for you to stitch along the solid line, which as we previously learnt is 1/4″ in from the trimmed edge. Now I’m going to let you in on my dirty secret. After dozens of blocks of all shapes and sizes, I still HATE joining sections together. I can’t seem to pin them without shifting the layers out of alignment. 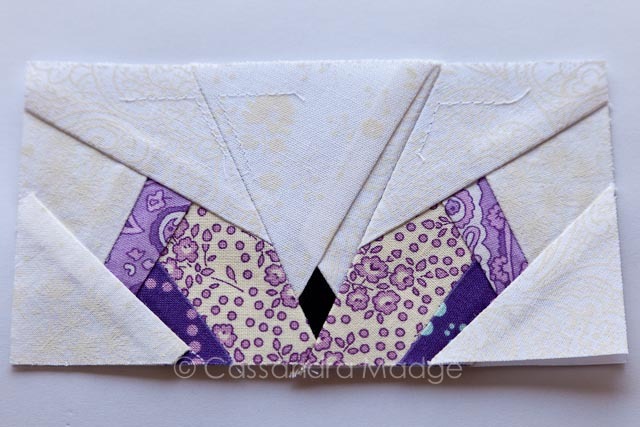 In a larger block with more seams to match I have used glue to baste the sections together which is quite useful. What I am showing you here is MY way. Please feel free to experiment with pins, glue, clips etc and find a way that works for you. This is my “trick” to make this step as painless as possible. 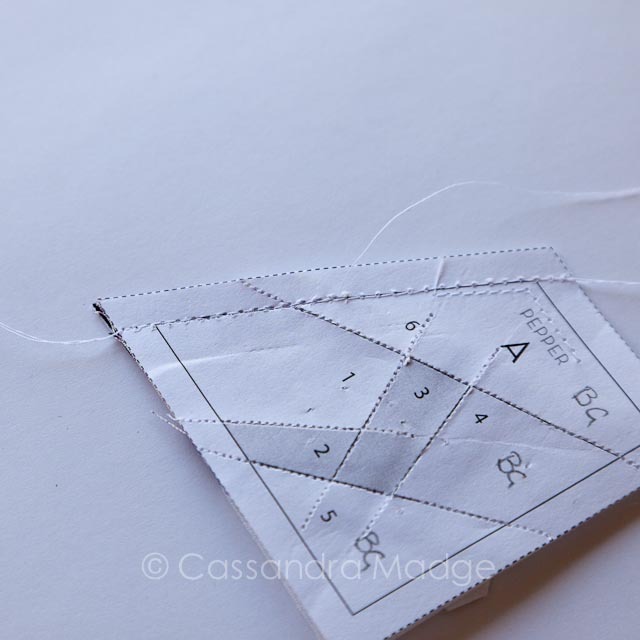 I use a much longer stitch length (2.9-3) and test sew each seam. I do this for three reasons. 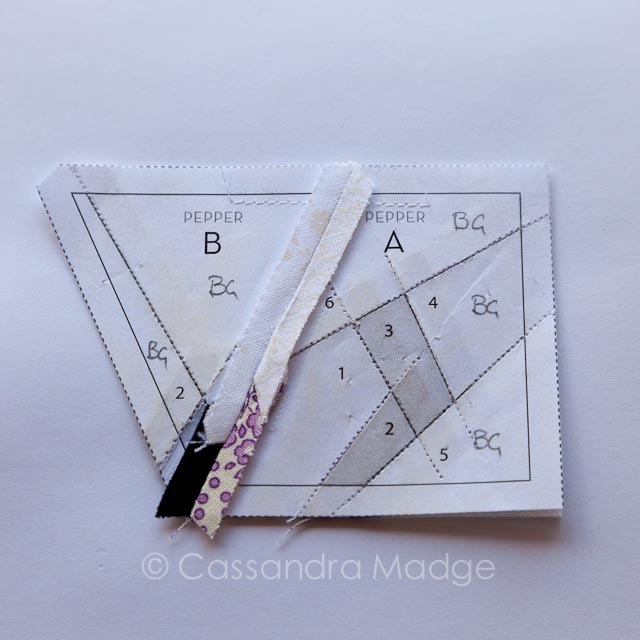 Firstly, it’s a simple way to baste the two sections together and keep them in place when I stitch them again using the necessary small stitch length. Secondly, it is a simple way to ensure that seam intersections and key points, seam allowances etc are lined up properly. Third and most important, it is a heck of a lot easier to unpick than teeny tiny stitches! For my first seam above, you can see from the top it looked pretty well spot on, however when I flipped it over, I realised that I had missed the line enough for me to be unhappy. I highlighted it with red, just in case you missed it. I unpicked it as far as the seam ripper, and after a little bit of fabric massaging, restitched it to make sure i had it right. 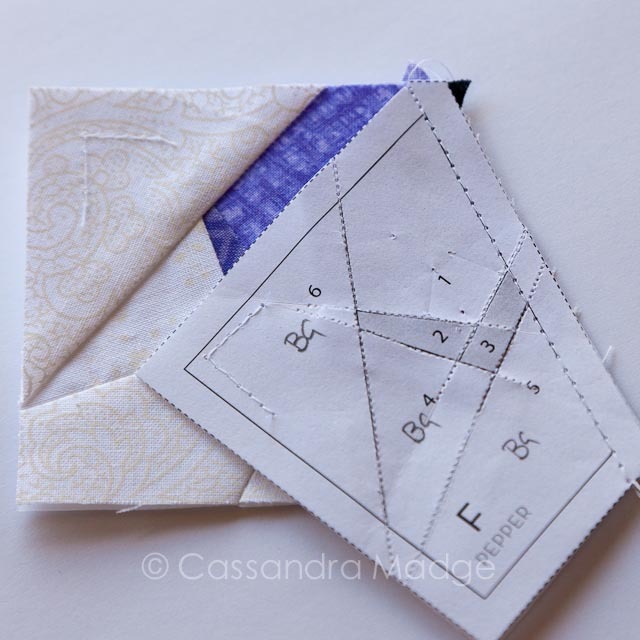 Don’t be afraid to try stitching a tricky seam from the other end if you are having trouble with alignment. 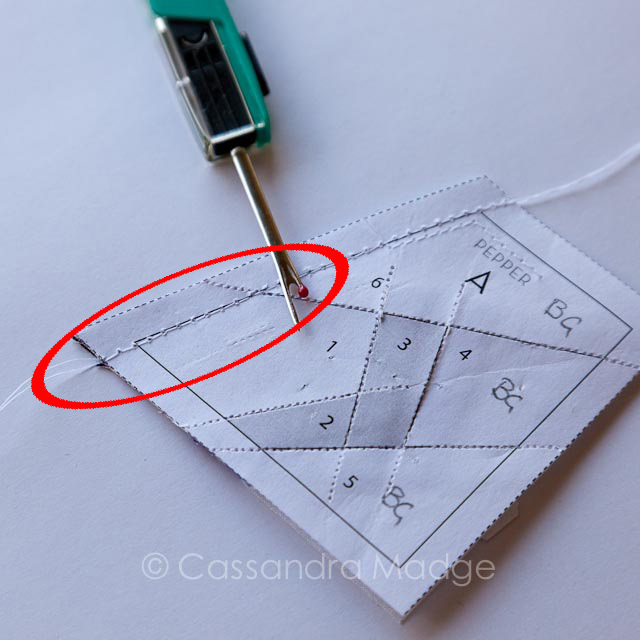 After you are happy with your how your seam has lined up, stitch exactly over the basting stitches with your shorter stitch length. 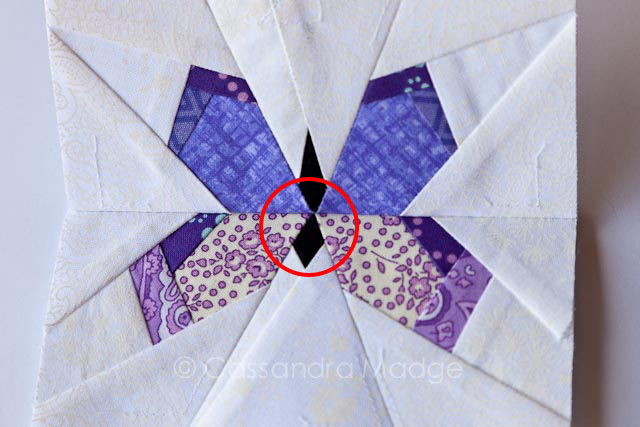 There is no need to take the basting stitches out unless they have strayed into your piecing area. 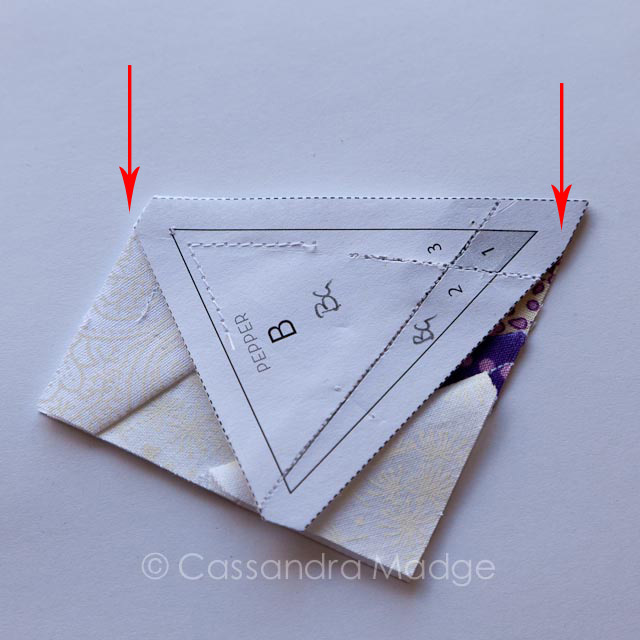 Because I’m all about making things easier, I’m going to suggest you take off the paper ONLY on the seam allowance you just stitched – on both sides of the seam. Doing this makes taking the paper out at the end so much simpler. Trust me, you’ll thank me for it later. I chose to press this seam open, but that’s not compulsory. 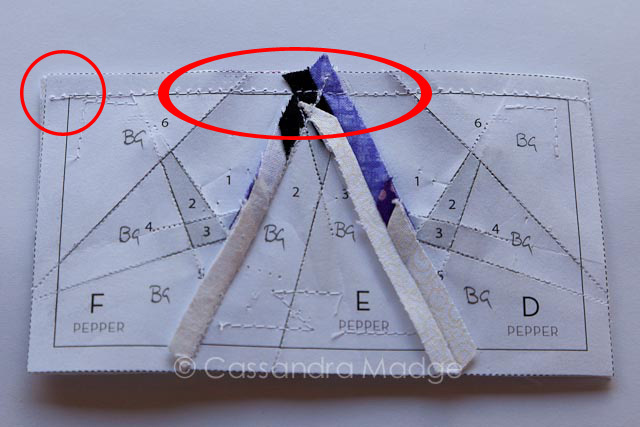 Now sit back and admire your beautifully straight top across A and B, then grab section C because that’s up next. 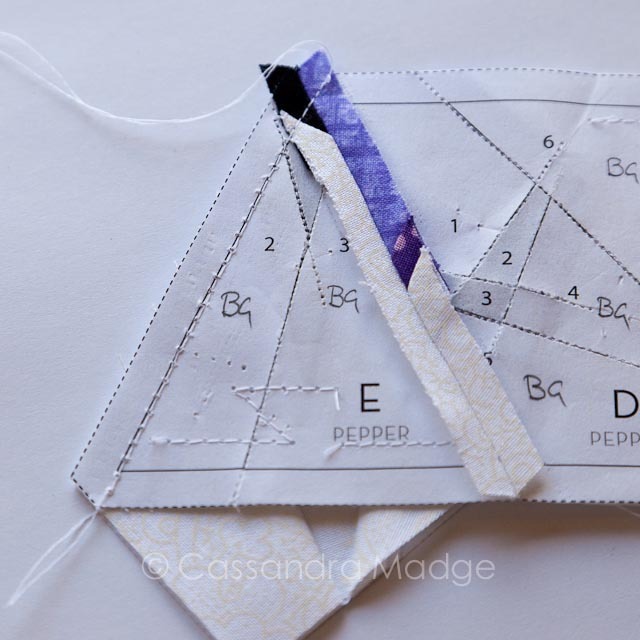 Again you can see how fabulously Nicole designed this pattern with the little cutouts that help you align each seam. I was having a rough day I think because yet again I wasn’t happy with my basting (stitches off line and the end not lined up flat) and I ended up taking it out and completely re-stitching it. Again, I did it starting from the opposite end and it worked much better for me second time around. 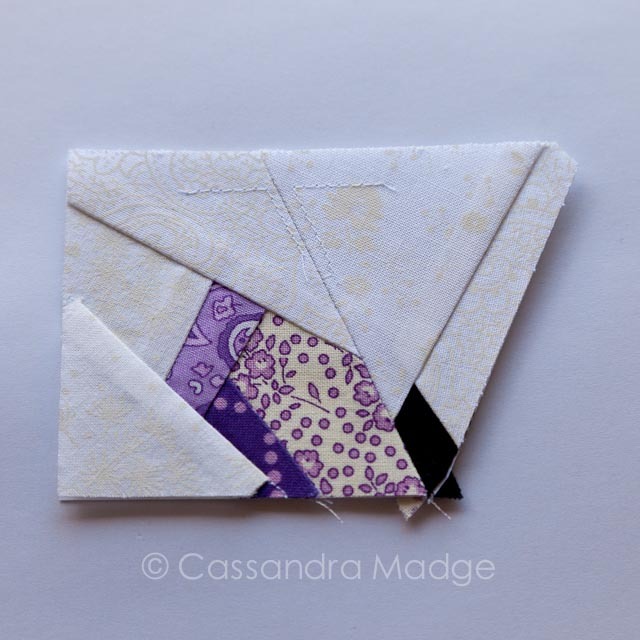 Don’t forget to tear your paper off your seam allowance again before giving the top half of your butterfly a good press. 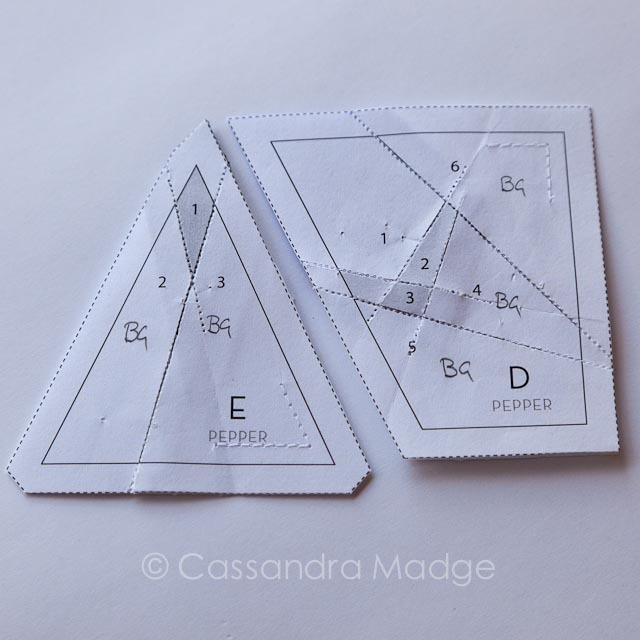 Time to join the bottom half, starting with sections D & E. Again with those sweetly aligned corners, making this pattern so simple to put together. I even managed to baste these two together first time with no need for the seam ripper! 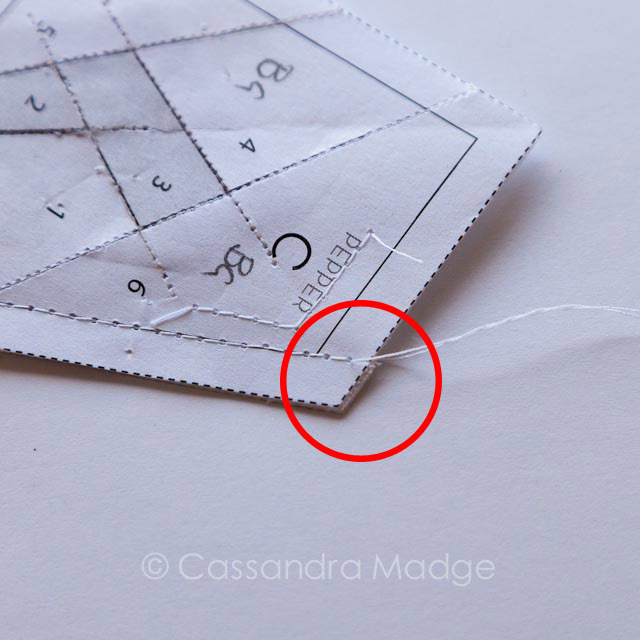 Don’t forget to keep changing your stitch length back to short (1.4-1.5) before doing the final stitch of your seam. 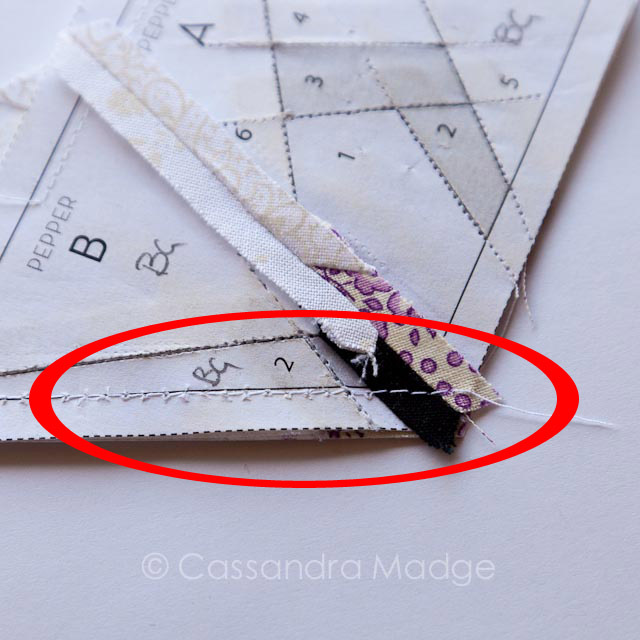 A common problem you will come across when paper piecing is the paper coming off prematurely. 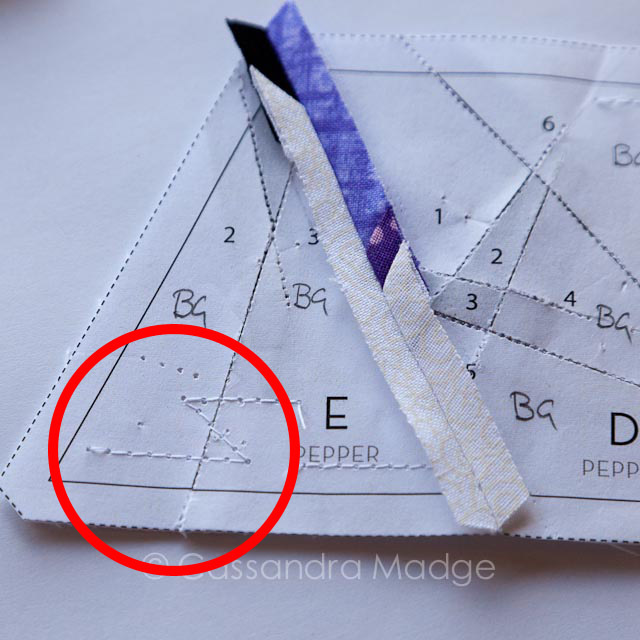 Without the paper, you will not be able to see the lines to ensure accuracy of your seam lines. You can use sellotape to join the pieces back together, or run some basting stitches over the seam as I did above. As I mentioned in part 1 of the tutorial, sellotape is a great fix, but just make sure that you don’t touch it directly with your iron as you will leave a gunky mess on it. Finally, we add section F. If you look at the basting stitches above, I was slightly off the line at the back, but it was close enough for me to live with. 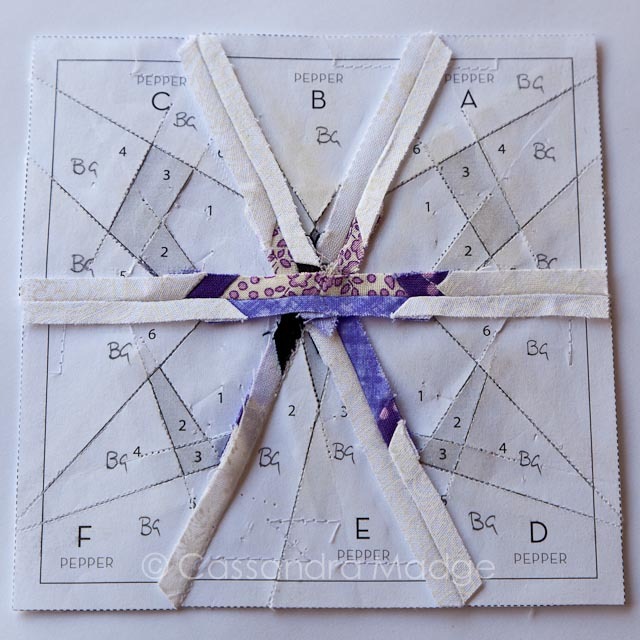 Paper piecing, like patchwork in general is often about a personal judgement. Have you changed your stitch length back again after basting? 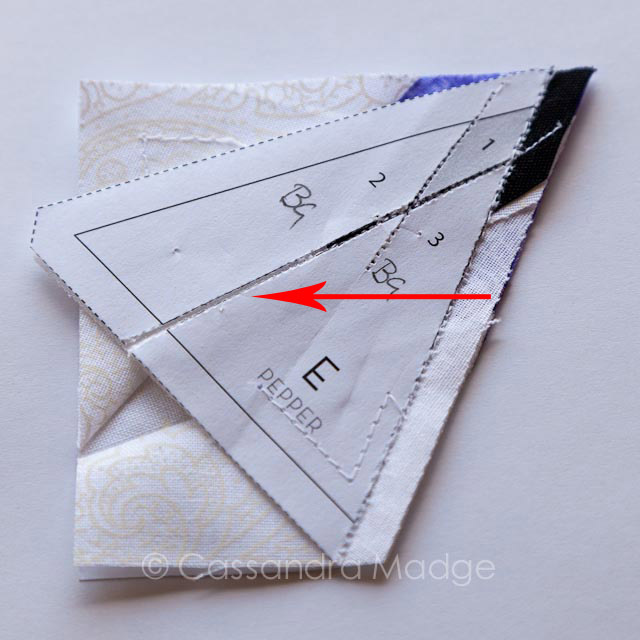 As usual, don’t forget to take off your paper from the seam allowance. In this case, I found it easier to press the seam to one side rather than open. Again, this is personal preference. 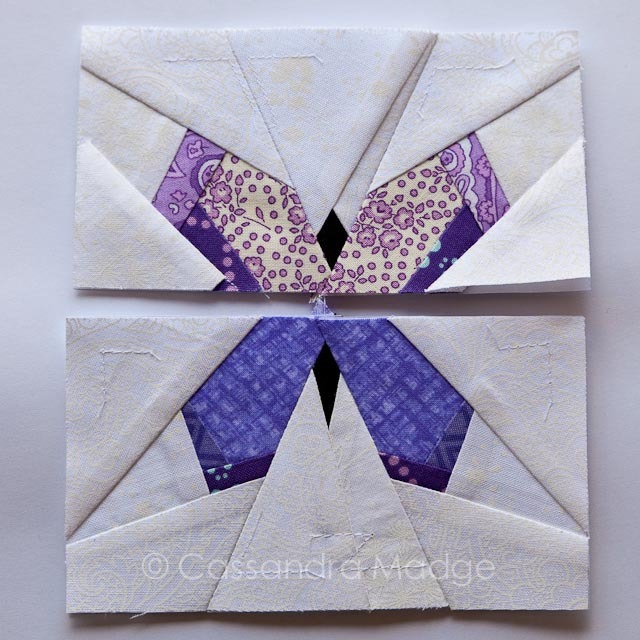 So, here we have our top and bottom halves of our butterfly, ready to join. For this design there really is only a couple of key areas – most important to align is the body join. As you can see, my alignment first time was an epic fail! My seam was so far out that it wasn’t salvageable, so I seam ripped the whole thing and started again, this time starting from the centre and working first in one direction, then the other. 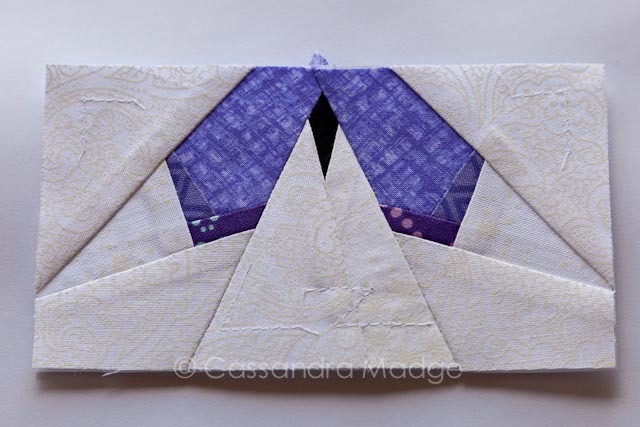 I will admit that my final seam wasn’t perfect, but I still am really happy with my little butterfly. 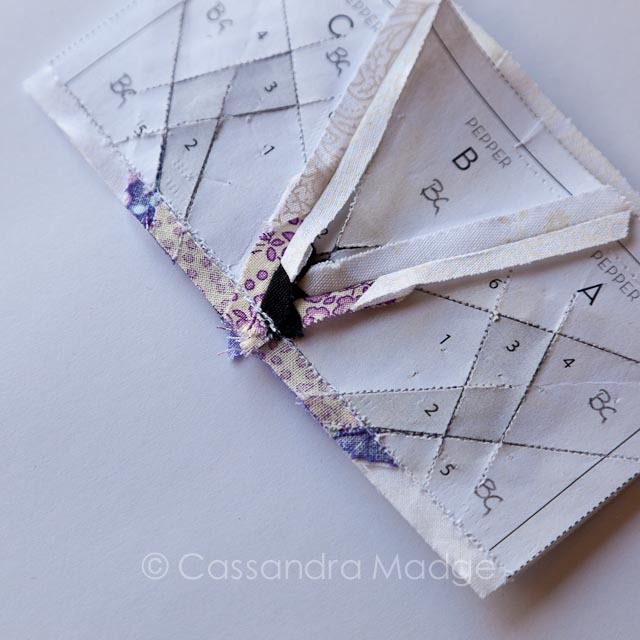 I took the paper off the final seam, then pressed it open, given all of the block a thorough press at the same time. Now for the most satisfying part, which is taking all the paper off the back. 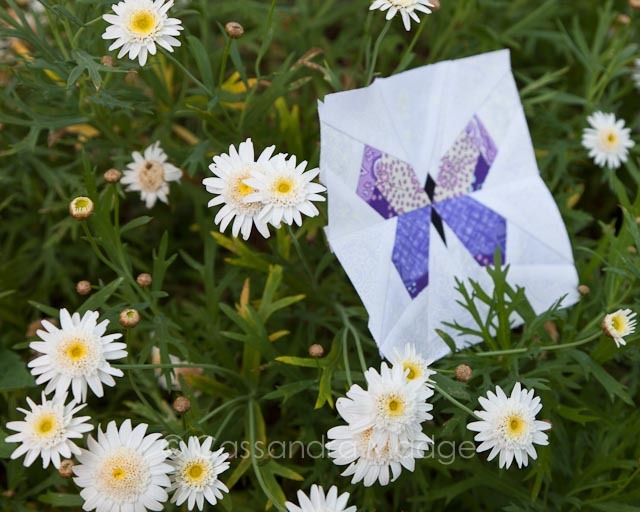 Your little butterfly is finished and ready to be set free into whichever project you like… although you might want to take it for some fresh air first! 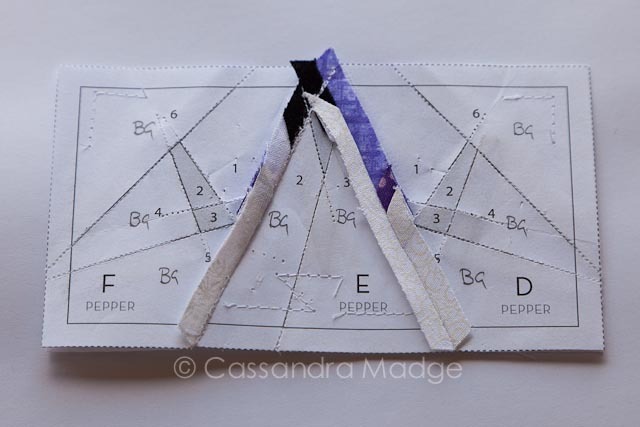 I do hope that you have enjoyed this two-part tutorial on foundation paper piecing. 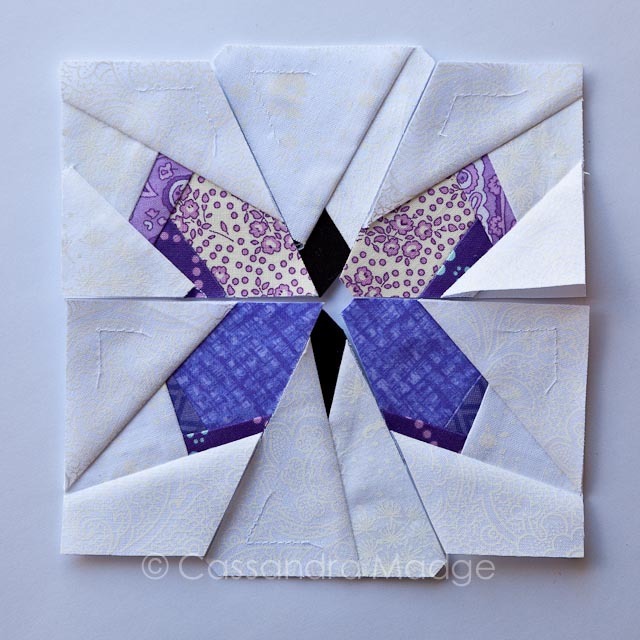 If you have any specific issues or requests for future tutorials or even just if you’ve made a butterfly block, I’d love you to leave a comment. Links to some of my other tutorials are HERE. 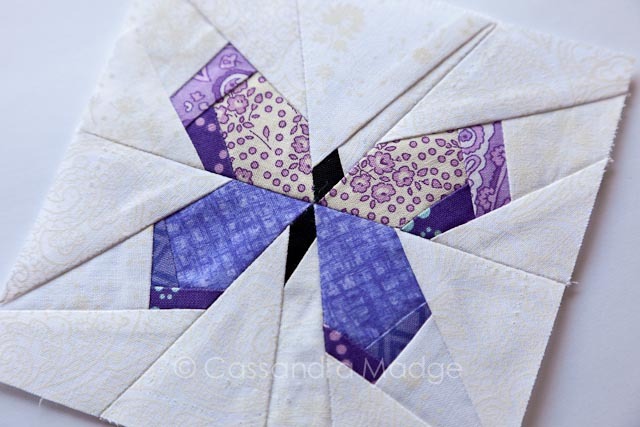 Nicole is going to be posting some of her favourite paper piecing tips on her blog, so make sure you check those out as well. 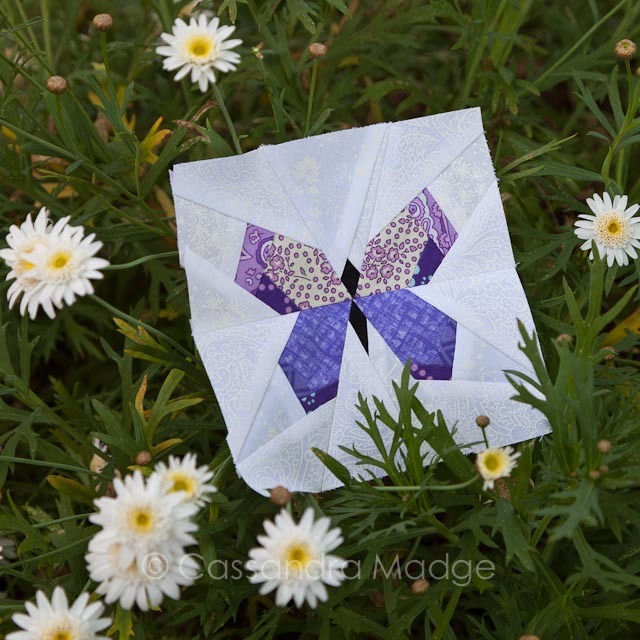 Once you have some confidence with paper piecing, she has some beautiful patterns for you to try – including my favourite, the Take Wing butterfly. 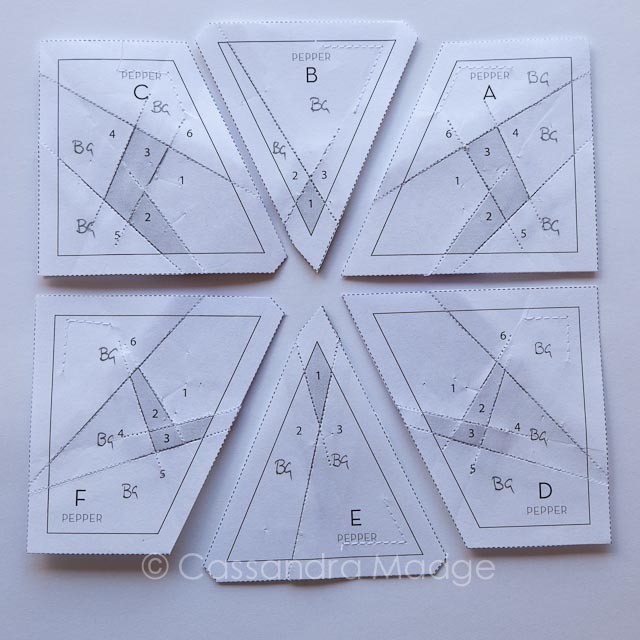 Please feel free to pin this tutorial for future reference, or subscribe to my blog or newsletter if you want to be kept updated regarding my crafting adventures, occasional lame jokes and quilting shenanigans. Thank you so much for sharing. 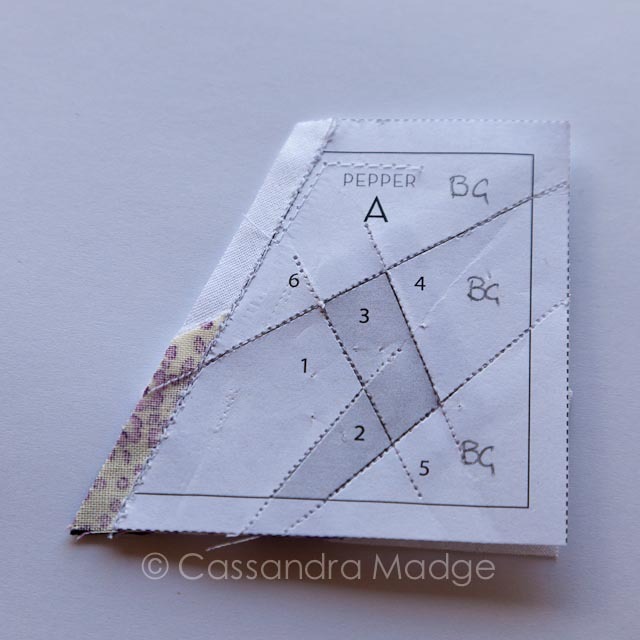 I looked at the pattern and even slept on it and still couldn’t figure it out. You were so much help. Misty, thank you so much for your comment! I am really happy to hear that it helped you. Thank you!!! 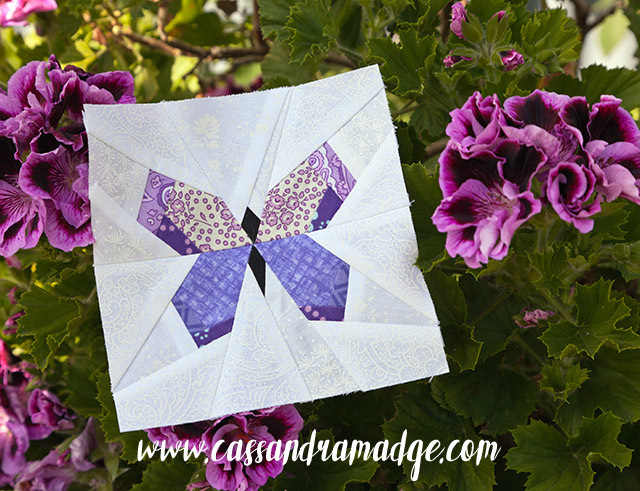 I am attempting to make this butterfly block and had no idea how to attach the pieces. Your tutorial was very clear and I am grateful I found it. 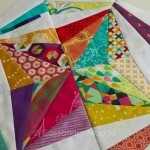 I also appreciated that you shared little tips such as basting to help fabric stay in place. Many thanks!!! 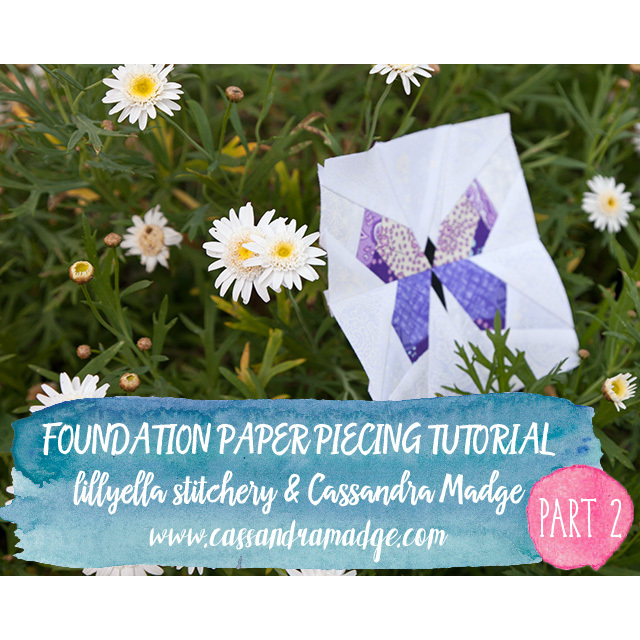 I recently became interested in foundation paper piecing and downloaded the butterfly pattern from lillyella. 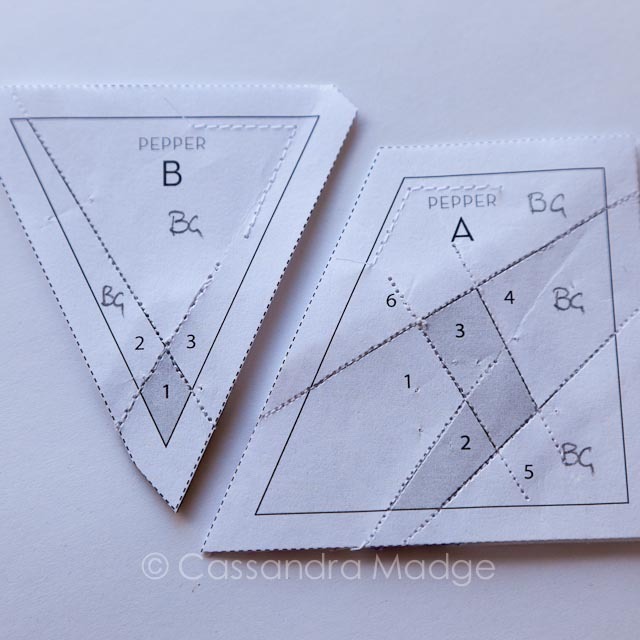 I pieced my first ‘Pepper’ but my seams did not match. 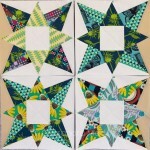 After searching for a tutorial I discovered yours and now realize I did not sew the pieces together correctly to get a square. I am pleased with my second attempt. Thanks for taking the time to create and share your tutorial.